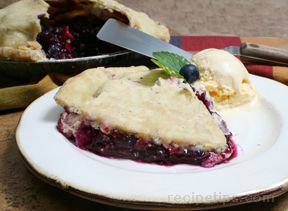 The combination of blueberries and apples makes for a luscious pie. Blueberries are not just delicious tasting but they are also good for you. See other Blueberry Recipes for ideas on great dishes to make. Let us show you how to make a double crust for this pie. Prepare pastry for (2) 9" pie crust. Roll out on lightly floured surface to 10"-11". Transfer to 9" pie plate. In large mixing bowl, place cut up apples and washed blueberries. Sprinkle with lemon juice and toss gently. In small bowl, mix together sugar, tapioca, nutmeg and cinnamon; sprinkle over fruit and toss gently. Grate lemon over fruit and let stand 15 minutes. Spoon filling into prepared pie crust. Dot with margarine. Top with piecrust, slit the top for the steam to escape. Crimp the edges to seal. 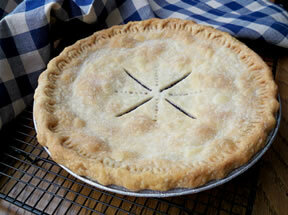 Trim extra pastry off and cover edges of pie crust with strips of foil to prevent over-browning. Bake in preheated oven at 375° F for 25 minutes. Remove foil strips and bake another 20-25 minutes or until crust is golden and filling is bubbling. Serve with whipped topping or vanilla ice cream.